The good news is that sometimes to find out what is really going on, you just need to wait for the next round and since then we’ve had two more major pieces of government-produced labor data. The first is the Department of Labor’s Initial Jobless Claims data. This series, while choppy, tends to lead unemployment. So, while commentators have been quick to point out that it is relatively easy to get unemployment down when the labor force participation rate is low, initial claims indicate that a 3.9% unemployment rate is not absurd. With the 4-week moving average of Initial Claims hitting 216,000, ‘the lowest level for this average since December 20, 1969 when it was 214,500’ unemployment may even drop further. The release also offers some additional color. 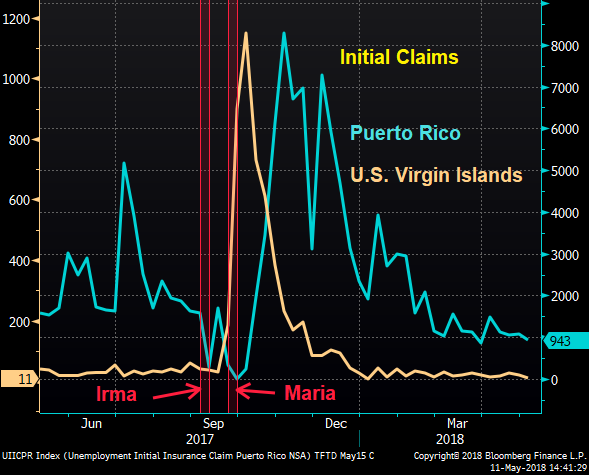 It points out that in Puerto Rico and Virgin Islands, claims still aren’t back to normal following hurricanes Irma and Maria. Also, Massachusetts and Pennsylvania saw significant decreases in the number of initial claims with fewer layoffs in transportation, warehousing, and construction, respectively. This latter point shouldn’t come as a surprise and is consistent with the Beige Book, Fed data covered here and last week’s TFTD. The second major release was the Bureau of Labor Statistics’s data on Job Openings and Labor Turnover. While hires and separations didn’t inspire flowery prose, i.e. ‘little changed’ and ‘the job openings level increased to a series high of 6.6 million. The series began in December 2000.’ This bodes well for the economy because, like the railroad index we highlighted in the April 24 issue (linked above) of TFTD, Job Openings, and particularly Manufacturing Openings, have a strong correlation with Industrial Production.